How to export a report for QuickBooks. TheraNest provides a billing report that is specifically formatted for uploading into QuickBooks Online. You'll want to adjust your import settings on the Quickbooks side to accommodate the export before importing. You will need Billing permissions to pull this export. 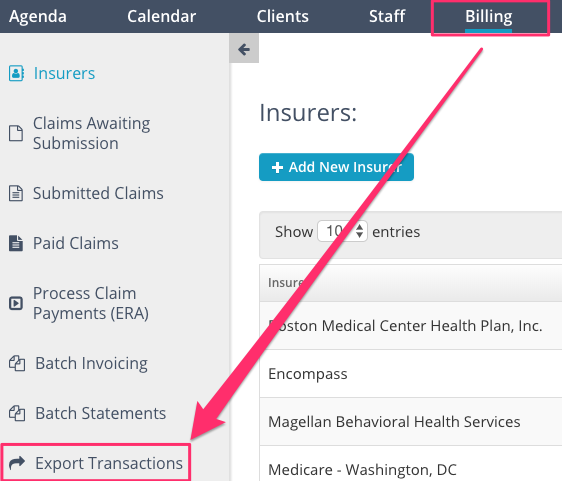 1) Navigate to Billing > Export Transactions. 2) To match QuickBooks formatting, you can select a date range and either Transaction Method, Client ID Number, Transaction Notes, or Payment Number to appear as a column in the report. The Transaction Date and Amount will pull to the report automatically. 3) Click the Export Transactions to .CSV button. Transactions are available for export for up to 15 months back. The gross transaction amount is exported for credit card transactions. We recommend you limit your date range to one month or less, as accounting software often limits the number of transactions that can be imported at once.